The Easter Sepulchre was a feature of many medieval churches, and was used in ceremonies of Maundy Thursday, Good Friday and Easter Day. 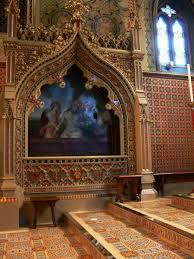 The Sepulchre Pugin designed for Cheadle is particularly splendid. The ogee canopy seems to have been inspired by the 14th Century tomb of Aymer de Valence, Earl of Pembroke, in Westminster Abbey. In the back of the recess there is a representation of the entombment of Christ painted on metal by Eduard Hauser. ​Below is the inscription passus et sepultus est (he suffered and was buried), and on the front of the sepulchre itself are the emblems of the Passion painted on metal shields.